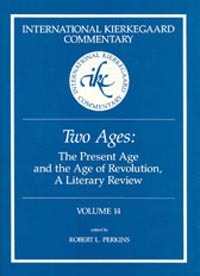 International Kierkegaard Commentary: Two Ages is the first major work on Soren Kierkegaard’s Two Ages in any language, based upon the first complete English translation. This collection of fresh new essays makes a considerable contribution to a new and fairer understanding of Kierkegaard that is now being developed; until now, his individualism has been considered as antisocial. In Two Ages he shows how his concept of the individual can be negotiated into a broad critique of modern liberal society, politics, and, to an extent, economics. This new understanding of Kierkegaard will also throw light on the first existentialist critique of modernity, an aspect of Kierkegaard’s thought that has been almost completely neglected. The remarkable thing about Kierkegaard’s second literature, that published under his own name, is that in it he moves to a new stage of his analysis of the problems and achievements of the self’s successive acts of self-determination, with the social dimensions of self-development only implicit. In the second literature, the emphasis is reversed: Kierkegaard emphasizes the social dimension of the self’s act of choice, and the personal dimensions are only implicit. This commentary shows not only how Kierkegaard broke new ground in the philosophy of society, but also how his ideas have, to some extent, influenced subsequent social philosophy, and how his concepts compare with and contrast to those of others such as Heidegger, Nietzsche, Scheler, and Weber. This collection represents the first cooperative effort of the large community of Kierkegaard scholars to gather and present the results of recent research.